It happens, and it’s usually unpleasant, to say the least. If you’re going through a divorce, you certainly don’t want to add to the anguish and inconvenience, especially when it comes to splitting up your assets. Finding someone who is in the market to buy a house in Carrollton – in this case, your house – may be one of your goals at this time. Another option – and maybe the best one if you need to sell your house quickly in a divorce – is to try a Carrollton cash home buyer. If you do this, you can expedite the whole process, get a fair value for your house, and avoid much of a headache. The whole process of selling your home to such a company – for a fair cash offer – can take as little as seven days – just one week, not months. Again, the professional home buyer buying a house in Carrollton pays cash, which means you don’t have to sit around waiting for a retail buyer to get a loan. Also, you won’t have to pay for any repairs to your house before you can sell it. The company will make and pay for all needed repairs. In addition, the reputable companies pay all closing costs. 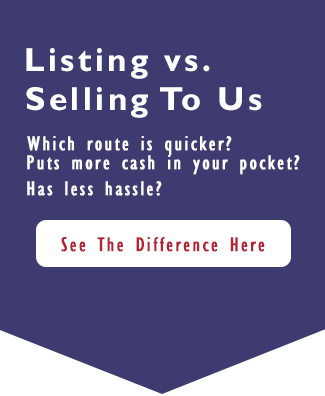 If you need to sell your house quickly in a divorce in Carrollton, you just might consider a cash home buyer in Carrollton. It’s easy, It’s fast. You’ll get a fair cash offer. Discover more, contact us by phone (214) 329-4444 or FILL OUT THE FORM.